Turkey’s Prime Minister Recep Tayyip Erdogan has rallied tens of thousands of supporters in Istanbul, telling them it was his duty to clear a city square that has been the focus of anti-government unrest. Recep Tayyip Erdogan denied he was a dictator, criticized foreign media and vowed to “identify one by one those who have terrorized the streets”. Unrest has continued in Ankara and Istanbul, with police firing tear gas. Two trade union groups have called a one-day nationwide strike for Monday. The protests in Turkey began on May 28 against a plan to redevelop Istanbul’s Gezi Park, but snowballed into nationwide anti-government protests after the perceived high-handed response of the authorities under their three-term prime minister. Medical officials estimate that 5,000 people have been injured and at least four killed since the protests began. The rally in support of Recep Tayyip Erdogan and his Islamist-rooted ruling party, the Justice and Development Party (AKP), was held in the Kazlicesme district, about 6 miles from central Istanbul. He criticized the international press and social media for the coverage of the unrest, urging them to be ethical and honest. “If the international media want a picture of Turkey, the picture is here,” he said. 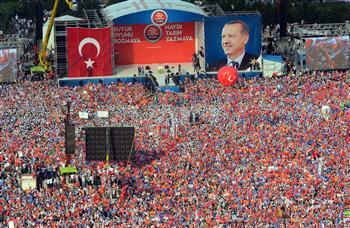 Recep Tayyip Erdogan denied being an authoritarian leader and said the protests had been manipulated by “terrorists”. He said: “They say <<you are too tough>>, they say <<dictator>>. What kind of a dictator is this who met the Gezi Park occupiers and honest environmentalists. Is there such dictator? Gezi Park ctivists have called on protesters to return to Taksim Square but it is now cordoned off by police. There have been sporadic clashes in surrounding areas, with police firing tear gas and water cannon. Istanbul’s governor, Huseyin Avni Mutlu, said the public would not be allowed into the square, adding that it would be “unsafe” for protesters to try to gather. One protester, Mey Elbi, said the demonstrators would not give up. Unrest spread to other parts of Istanbul. Protesters ripped up paving stones near the Galata bridge and police fired water cannon in the upmarket Nisantasi district. As night fell, barricades were being erected in a number of city neighborhoods as youths faced off against police. Some 1,000 riot police officers earlier arrived at Ataturk Airport from regions as far away as Diyarbakir and Sirnak, local media reported, to try to curb the Istanbul unrest. Riot police could be seen leaving the city’s airport and getting on to coaches bound for the city. At least 350 police on duty at the airport were also deployed to the city centre in case of possible clashes, Turkey’s Dogan news agency reports. Police also fired tear gas and water cannon to clear demonstrators in Ankara’s Kizilay Square on Sunday afternoon.